Pastor Dave Andrus was installed as Pastor of St. Paul's Lutheran Church, St. Louis, Missouri, and Pastor for the Blind on January 10, 2016. The members of St. Paul’s Lutheran Church appreciate Andrus's leadership and care but also saw his pastoral heart for people who were blind. 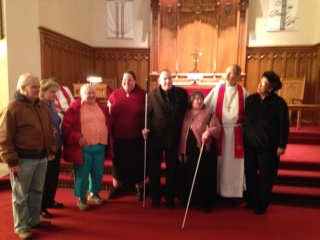 Therefore, they made it official and called him to their church and this ministry to help the blind. 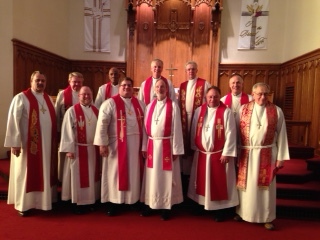 The installation worship service Took place on January 10 in the afternoon. 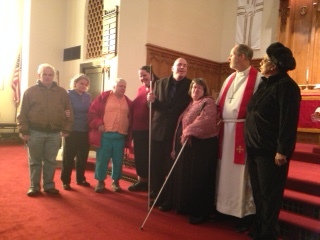 Besides members of the congregation, clergy from the St. Louis area, 6 people who are blind were also present. They were some of the people who encouraged Pastor Dave Andrus to start a new ministry. Left to right in the first two pictures are Robert Vaughn, Kim Vaughn, Terry Rogers, Cecilia Lee, Brent Ford, Cari Ford, Dave Andrus, and Jesusita Taber. Since Pastor Andrus has been at St. Paul's Sunday and Tuesday attendance has increased. This inner city church has benefitted from Andrus' many years of mission and small group experience.